African recipes made with jam and jelly are sweet and delicious when eaten with bread, as an appetizer snack, main course or as an African dessert recipe. What makes jam and jellies solidify? 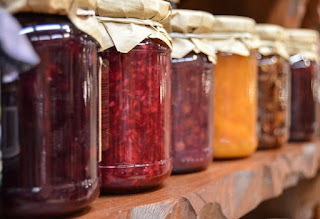 Pectin is the substance that makes jellies and jams solidify however, this essential ingredient does not exist in all fruits. Fruit that is slightly under-ripe contains more pectin than overripe fruits. In addition, the white inner skins of lemons are excellent for jelly and jam making and to supply pectin to other fruits however it has a bitter taste. African recipes made with jam and jelly are sweet and delicious. Leave a few stones in for flavor. For jam, half as much water as fruit. For jam, just enough water to keep from burning. ¾ cupful of sugar to 1 cupful of pulp. For orange marmalade weigh oranges slice cross- wise with sharp knife as thin as possible; remove seed. Cook in water to cover. Three-quarters their weight in sugar. Grapefruit is sliced very thin, seed removed.